A disappointing turnout last week though I did collect an impressive list of reasons for non-attendance. The evening was cold but dry and those of us, both of us, who did attend had a good workout. This used the off-road footpath/cycle path south of the Bedfont Club. This has a streetlight at each end and 17 lights along the length of the path. The lampposts are equally spaced at about 22metres apart. This means that starting at a lamppost and running for nine lampposts amounts to very close to exactly 200meters. And by choosing the starting post four lampposts in that meant that we had a nice run up and a run off from each of the 200s that we did. The club has had a "Round-the-Block" race around the streets of Cranford and Heston since the early 1980s. Hopefully you will be able to join us, as a generous lunchtime break from your work locations, or from your retirement cottages. Over the years the course has been the same other than we've slightly varied the start and finish location and therefore the distance between them. We'll do the full lap this year, which I've GPS measured at 3.4miles/5.5k, and with the start and finish at one of the grass areas opposite the Community College. Street parking should be straightforward. The course is shown on the club map or more clearly here. 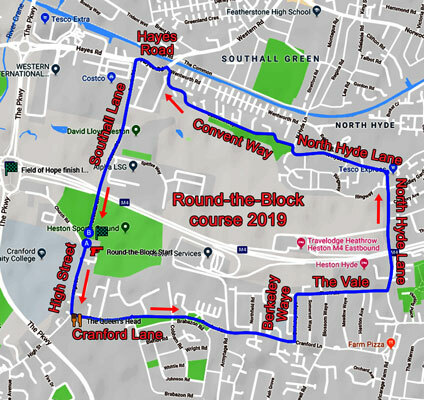 Note that we have no access to either the Heston Venue or Cranford Community College so participants will need to arrive ready to run and return whence they came to shower and change afterwards (perhaps via the Queen's Head first). Please attend and encourage your friends and colleagues to join us also. Traditionally we charge £1 for participation in this event and this is donated to White Lodge. 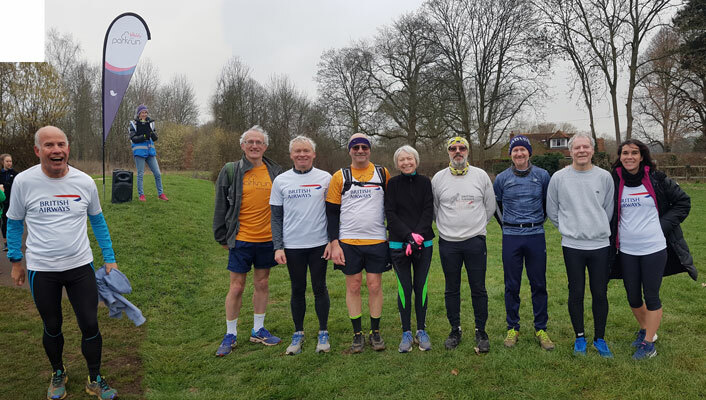 The club featured parkrun at Higginson, Marlow attracted a good gathering with Alice Banks starring as race director and John Banks also there as a volunteer. The team photo below (left to right) snapped David Duggan, Alice Banks, John Dennison (friend), John Scaife, Neil Frediani, Benita Scaife, Chris Kelly, Barry Walters and Maria Jovani. Maria Jovani (20:54) maintained the good form she has been in since New Year’s Day and set another club record. Barry Walters (23:43) was the best of the men. Five of us were running at the Marlow parkrun for the first time and eleven members have now run the Thames towpath course at least once. David Duggan’s event report is ready to view on the Higginson Marlow parkrun website. Elsewhere Denis Foxley (28:57) was part of a record attendance at Rickmansworth of 605 where they were celebrating the 100th running of parkrun round the Aquadrome. Petra Otto (36:58) ran at Doncaster for the first time and added to the club total – now up to 465 different parkruns. Janet Smith (35:10) made her visit to Upton House (Poole) and with 97 runs now completed needs just three more to earn her black vest. There were speedy performances from Kay Trinder (21:08 at Brooklands), James Shoulder (20:19) at Bedfont Lakes, Paul Davis (20:46 at Brooklands) and Maarten Stenham (21:11 at Hazelwood). I missed both Monica Alonso and Alastair Heslop off the list last week after they both volunteered at Guildford parkrun. Also Monica recently ran at Crissy Field near San Francisco but that result was also missed. Crissy Field results are vulnerable to getting missed off because it is usually the last parkrun in the world to finish. Eleven different club runners have run at Crissy Field, second as an international parkrun only to East Coast Park parkrun in Singapore with 12. Wimbledon Common was the second parkrun in the world, and not far from our home base, yet only ten club runners have ever run there! Well, we weren't quite able to get us all into a single photograph without the help of Photoshop but with Alice busy with Run Director duties that was never likely to be possible. After my first invitation, to judge the U.K.’s biggest rabbit show in January 2020, i.e. The Bradford Championship Show, I decided to do a recce to the venue in Doncaster, in order to get kind of organised. As one does, I checked if there were a parkrun nearby, and so yours truly turned up at 9 am for her first Doncaster Parkrun. It was frrrreezing cold, and I looked like ‘Michelin Woman again, wearing three thermal layers, one Goretex jacket, two pairs of gloves, a ‘turtleneck’ fleece, and a very thick bobble hat! Doncaster parkrun compromised of one lap around the lake, plus three laps around the perimeter of the park. It had us all soon puffing and panting along the undulating course, which included something for everyone, from mostly grass, to a lot of very slippery mud, and also some goose poo!!! I finished my 75th parkrun in one of my slowest parkrun times, in 36:58mins. Never mind, at least I did it! "First and last cross country for 2019 this season. Happy with a medal and turning to indoor track next week. Love the shorter distances !"